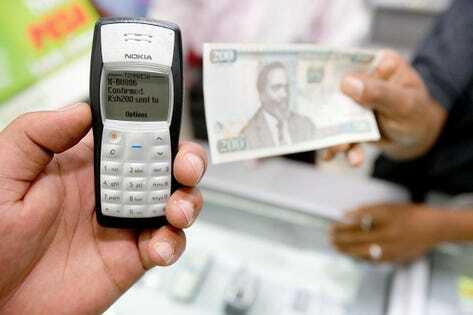 A M-Pesa transaction in 2008 using a Nokia 1100 feature phoneVodafone. Africa is well-known for its ascendancy in the newest form of electronic payments, and this year saw the rise of a new form of mobile banking, particularly in South Africa where several new mobile banks launched. With over half of the world’s mobile money services and the continent’s mobile-only nature, Africa has been the ideal breeding ground for this next generation of banking offerings. Attracting the most attention is Bank Zero because its founders are the former big-wigs at First National Bank – including former CEO Michael Jordaan – which evolved into the country’s most innovative bank, launching the first banking app in 2010 and winning a string of global awards and achievements for innovation. As its name suggest Bank Zero Mutual Bank won’t charge fees and will focus on savings. Although it won’t offer credit, Mastercard will supply a credit card if users ask for one. The other major announcement, which is launching in the first quarter of next year, is Discovery Bank, the new banking division of South Africa’s largest health insurer. Discovery pioneered a medical aid system that promotes its members to be more healthy by offering them incentives and discounts through its this scheme. Launched in 1997, the Vitality health incentives system rewards healthy behaviour (going to gym or exercising, eating healthy food and having regular health checks) with cheaper rates for air flights, movie tickets, gym memberships, coffee and food from local food chains. It also offers discount vouchers for department stores. The higher up the tiered system a user moves, the bigger the discounts. Vitality now operates in 19 countries and serves 17.8-million people. Two years ago, it launched Vitality Active Rewards which used wearable health sensors to reward people being active and inspire health-related behaviour. One of the incentives was an Apple Watch that users got for free by reaching certain fitness targets. This culminated in a two-year “landmark study” of 400,000 people in The United States, United Kingdom and South Africa who used an Apple Watch that resulted in “dramatic and sustained improvements in physical activity levels”. “It is a tech-led bank that is aimed at incentivising behavioural change,” said Discovery Group CEO Adrian Gore. The bank’s “entire structure is based on behavioural change… following our purpose of being more healthy”. “This is not a skinny fintech play that is an app. It’s a proper capital-heavy proper bank, which is mobile-led and has a full retail offering,” he added, calling it the “first behavioural bank”. Banking in Africa is “among the most exciting in the world” and “a hotbed of innovation,” according to a McKinsey Global Banking report published earlier this year. The retail banking sector is “a locus of new business models, emerging in response to challenges including low levels of banking penetration, heavy use of cash, sparse credit bureau coverage, and limited branch and ATM networks”. Some 40% of Africans prefer to use digital channels for transactions, it found. Another new banking entrant is TymeBank, which was evolved from being the provider of the backend of MTN Money, the mobile payment service offered by Africa’s largest cellular network. It was bought by Commonwealth Bank of Australia, which this year sold its stake to African Rainbow Capital – the investment holding firm of South Africa’s richest man, Patrice Motsepe. Like the other two new banks, TymeBank announced alpha testing in November, but gained 1,800 customers in the first week of its unofficial launch. Meanwhile, great things are expected of Shyft– the currency exchange and wallet from Standard Bank, the continent’s largest bank. In 2017 Shyft won both the Stuff App Awards and the MTN Business App of the Year. Stand-alone payment provider Yoco also had a good year. After tripling its user basesince the beginning of 2017, the South African fintech startup Yocoraised $16-million in Series B funding. This brings the total investment into the point-of-sale company to $23-million(R322m). Yoco provides a credit card reader for transactions but last year added touchscreen tablets to give its customers an online platform to manage and sell their products. Since it raised Series A fundingin the first quarter of 2017, it now has 27,000 merchants on the platform, and is adding about 1,500 a month. “This round represents a vote of confidence in technology ventures operating in this market, servicing the untapped potential of small businesses,” CEO Katlego Maphai told me. “Only 7% of South African small businesses accept card payments, despite South Africa having a card penetration of 75%,” he says. Meanwhile, mobile money continues to boom in Africa. The original such service – Kenya’s M-Pesa – announced it would allow its users to make and receive payments though with PayPal and Western Union. With 28.5-million users in East Africa, M-Pesa can transact with PayPal’s 254-million global users and remittance giant Western Union’s 500,000 agents in over 200 countries. It has opened the regional mobile money sensation to payment gateways around the world. It’s a sign of the success of the 11-year-old service that it has become global through these alliances. In Kenya alone, M-Pesa processed 581 million transactions for its 23-million subscribers, worth $14,6 billion or $162 million a day or the three months to June 2018, according to the Communications Authority of Kenya. M-Pesa processes over 1.7 billion transactions a year which accounts for more than 50% of Kenya’s GDP. “The power of financial technology to expand access to and use of accounts is demonstrated most persuasively in Sub-Saharan Africa,” the World Bank’s Global Findex Database wrote in its financial inclusion survey which found 21% of adults in the region now have a mobile money account. This is “nearly twice the share in 2014 and easily the highest of any region in the world”. “While mobile money has been centered in East Africa, the 2017 update reveals that it has spread to West Africa and beyond,” the Findex survey added. MTN and Orange – two of the largest cellular operators on the continent – announced mobile wallet joint venture that would allow its mobile money users to interact across networks. MTN plans to be “the biggest provider of mobile financial services in Africa” according to Group CEO Rob Shuter. Meanwhile, calling it the first such mobile payment, the world’s largest smartphone maker also launched Samsung Pay in South Africa.